Ancom has designed and printed over 1,000 custom professional forms for our customers, including the Healthcare industry, whose offices have relied on our stock professional forms for years. At Ancom, you’ll find the ready-made forms that you need: HIPAA forms, HCFA forms, ADA forms, and Rx pads, along with X-Ray mailers, recall postcards, laser statements and mailing envelopes. To get started on designing your own custom professional form, see our Custom Forms section. 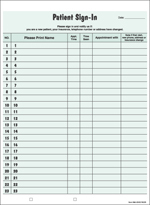 HIPAA Compliant Sign-In Sheet protects your patients' privacy. After they sign in, peel label off of top form leaving the information imprinted on bottom of form for staff use. 8.5" x 11", black ink on green form. 250/pkg.